Do you ever find yourself craving a meal that mainly consists of protein rather than carbs? One of the many sources of protein that we love right now is none other than QUINOA! The beautiful thing about quinoa is that not only is it diverse, but it contains a number of benefits. Do you ever find yourself craving a meal that mainly consists of protein rather than carbs? Don't get us wrong, we LOVE our carbs, but sometimes it can be a challenge to think of something to eat that has a solid level of protein to make sure we are getting good nutritional value. And guess what? Speaking of this protein-packed superfood, we have 5 amazing dishes that will ensure you are getting enough protein and even better...enough yum factor! Your cravings just may take the ultimate turn with these protein eats! 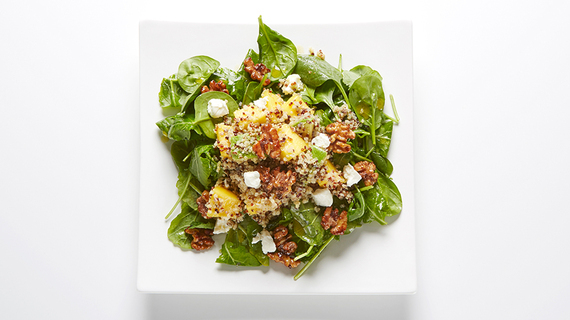 When we're told to "Think Green," we immediately flash to this incredible Green Goddess Quinoa Salad recipe. 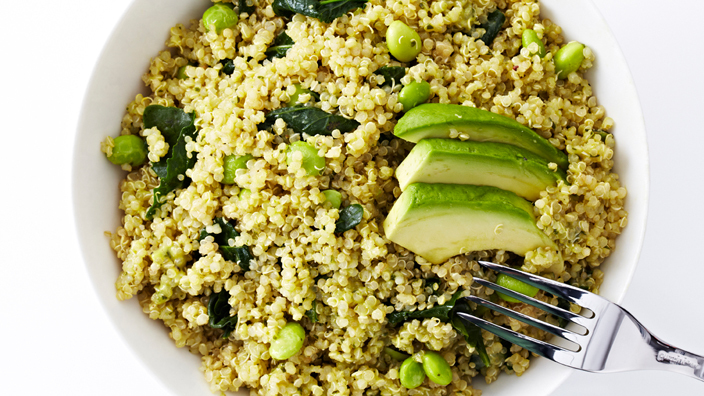 Protein-packed quinoa, mixed with edamame and kale, is tossed in a creamy avocado and fresh herb dressing. Really, there is paradise in every bite of this fresh and fantastic salad. Looking for the champion in the Super Bowl of Super Foods? This Kale, Spinach and Quinoa meal-in-a-bowl is a winner, a green bowl full of super nutritious and delicious stuff (including mango and avocado), tossed in a zesty lemon shallot dressing and topped with spiced walnuts and creamy goat cheese. Get cooking and give new meaning to Power Lunch! Puttanesca is rumoured to have originated among Napoli's nightwalkers. No surprise there. 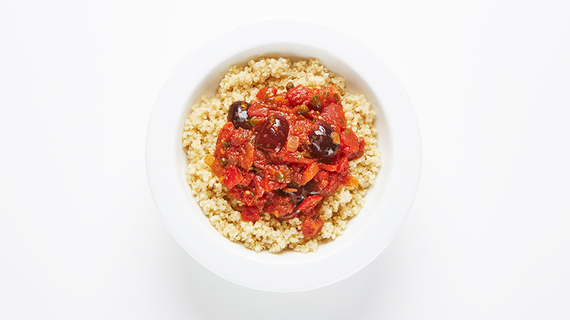 This sultry, spicy, aromatic red sauce of olives, capers and garlic is scandalously good. While the Oldest Professionals paired this kick-in-the-pants sauce with pasta, we've got a few tricks of our own. 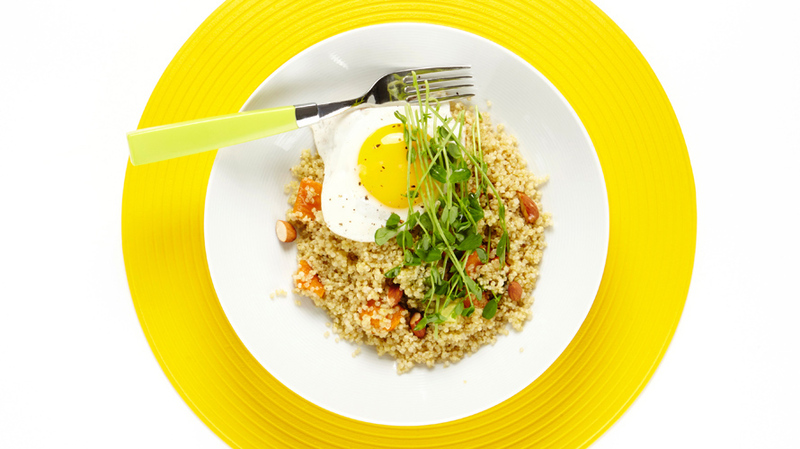 We've swapped noodles out for quinoa, the numero uno protein provider. There's nothing scandalous here... just two ladies of the night enjoying a seductively delectable bowl of quinoa. We're crazy for quinoa. While you might scoff at jumping on the quinoa bandwagon, there's nothing new (think: 4,000 years old) about this Super Grain. Not only does it pack a nutritional punch (protein and amino acids and anti-aging, Oh My! 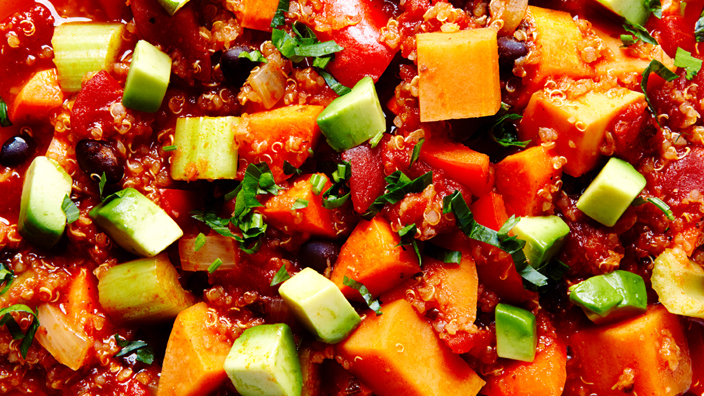 ), but this glorious grain also serves as the foundation for this easy, scrumptious Sweet Potato Quinoa Chili. Tender sweet potatoes, carrots, celery and red peppers are simmered along with cumin, chili powder and cayenne to create a most flavorful, satisfying meal-in-a-bowl.